Last week, I had the pleasure of attending the Argyle CMO Forum in San Francisco. With over 200 attendees, Argyle brought together marketing leaders from various industries to discuss new marketing strategies and best practices. One of the key topics of discussion? Digital transformation. In this digital age, successful organizations are keeping pace with technology changes and customer behavior. However, there are many challenges to overcome in order to achieve success. How do you implement innovative digital strategies and meet revenue goals at the same time? Who knew that it takes considerable effort to get people to go out? Most people fall into a rut of going home and staying in versus experiencing live events. Jennifer Betka, CMO of StubHub, candidly explained how hard it is to get people off the couch and has launched a new campaign to encourage people to “grab their ticket out.” It’s a great rebranding campaign on not missing opportunities of a lifetime; the foundation of which was built on understanding customer behavior. If StubHub did not profile their audience and uncover the truth about the effort it takes to get people to go out, their campaign would not have been successful. 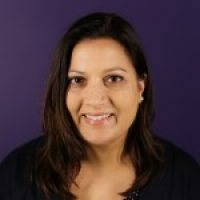 It was necessary for StubHub to first understand their audience’s behaviors and then speak to them as individuals. By putting in the time and effort to figure this out, they are now able to connect emotionally with people and identify target consumers across genres. If you don’t have agencies to help you with this, don’t fret. Understanding customer behavior can be done in numerous ways, an easy one being marketing automation. Marketing automation has transformed over the years into a scalable, behavior-based engagement marketing platform. It allows you to understand what people are really doing, beyond what they just say they’re doing. As the amount of customer interactions continues to grow, it’s imperative to listen and speak to your buyers in meaningful ways at every stage of the customer journey. Google’s Display Benchmark Tool reveals that 99.4% of online ads are ignored these days; in other words, marketing can seem like a big distraction to your buyers. The only way to fix this? Personalization! Dr. Volker Hildebrand, Global Vice President of Strategy, Customer Engagement, and Commerce at SAP Hybris, discussed how we can rethink personalization. He’s been passionate about this topic for years and stressed that personalization, when done right, should not look like marketing, but rather feel like a great experience. It should leverage rich customer information in real-time and deliver messages consistently across channels. Marketers must pivot away from segmentation, since often (2 out of 3) customers are pulled into an incorrect segment. A move towards individualization is needed to become more targeted and relevant. Unfortunately, this can be harder than it sounds. A 2015 study by Forrester Research, “The Contextual Marketing Imperative,” revealed large gaps in delivering personalization. 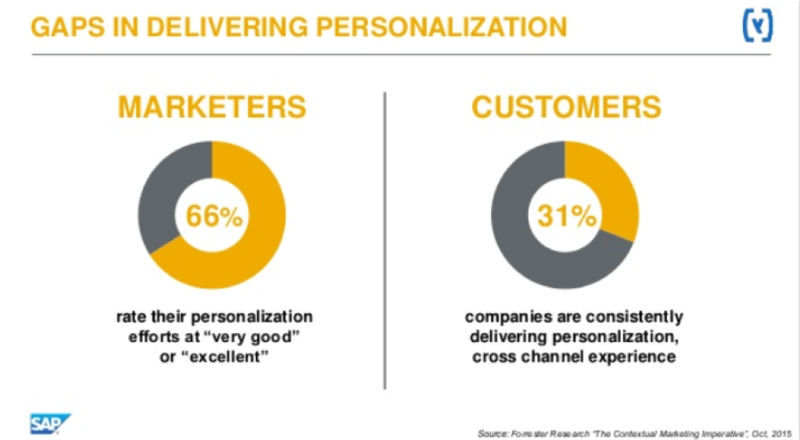 The survey results showed that while 66% of marketers rate their personalization efforts “very good” or “excellent,” only 31% of customers believe that companies are consistently delivering a personalized, cross-channel experience. That’s a big divide and means that, as marketers, we have a lot of work to do in this area. One way you can deliver a consistent, cross-channel experience to your buyers is to integrate personalization capabilities into the primary channels they access, such as your website—the hub of your marketing activities. Leverage a web personalization solution to treat your buyers as the unique individuals they are and make your marketing more effective by delivering relevant, personalized experiences. It’s the only way to deeply engage people you know as well anonymous web visitors that you don’t know yet. True digital transformation is a journey with multiple layers and aspects. Autodesk’s VP of Customer Engagement, Jeff Wright, shared how Autodesk shifted to a subscription-based model, which started their company’s digital transformation. It was an entire company effort that marketing played a major role in. In addition to focusing more on customer retention vs. acquisition, Autodesk also needed to improve customer engagement, and at the heart of their strategy was a shift in marketing from where Autodesk wanted to market to channels their customers were actually on. Becoming customer-centric and knowing the channels they’re on earns you “the right to be heard” by your customers. In order to transform digitally, you must have the right people on board. Over the last 12-18 months, Autodesk has completely revamped their hiring strategy and now looks for people who meet their C-A-A profile (Content, Analytics, and Automation). A candidate must be able to create content that is truly useful for their audience, interpret data and ask the right questions to iterate and optimize campaigns, and understand how to use marketing automation to truly engage their audience. It’s a drastic shift, but it’s one that has already paid off for Autodesk and can pay off for your own organization. To learn how to future-proof your organization, check out our whitepaper Designing a Marketing Organization for the Digital Age, developed in conjunction with Harvard Business Review Analytic Services, to learn the best way to design your team for success. It sure is an exciting time to be a marketer! Not only is the marketing landscape evolving, but the way we interact and respond to buyers changes every day. Hopefully, these three steps will help you on your journey to digital transformation. Do you have any examples or insights on what has worked for your organization? Please share with me in the comments below; I would love to hear them!